IPIALES, Colombia (Reuters) - Tears welled up in Gabriel Malavolta's eyes on Saturday as he realized his dream of a new life in Peru was over, at least for now. The 50-year-old mechanic fled Venezuela three days ago. He had hoped to make the overland crossing into Ecuador and then on to Lima, saying the deepening economic crisis in his homeland had left him without the basic means of survival. Traveling by bus with his fiance Yenny to the border town of Ipiales in southwest Colombia, Malavolta said he heard on the final leg of the trip that their plan had been ruined. As of 12 a.m. on Saturday, new regulations put in place by Ecuadorian President Lenin Moreno prohibit Venezuelans from entering Ecuador without a valid passport. Previously, they could enter with no other document than their national ID cards. Malavolta has a passport, but his fiancee only has an ID card. They arrived at the Rumichaca border crossing outside Ipiales just six hours after the new regulation took effect. "I don't know what we're going to do, but we can't go back. I'm not sending my fiancee to go back and go hungry," he said as he sat in a Red Cross tent in Ipiales. "You've no idea what it's like, whole families eat from the trash," he said of the desperate situation back home. 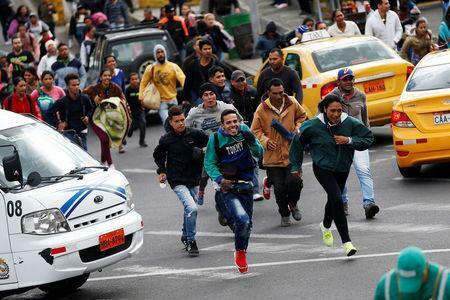 More than a million Venezuelan migrants have entered Colombia over the last 15 months, according to official estimates, but Ecuador has also received many refugees until now. About 300 Venezuelans were lined up at the border crossing early on Saturday. Like Malavolta's fiancee, many indicated they had no passports to gain entry to Ecuador. Peru's government announced immigration measures similar to Ecuador's on Friday, with passport requirements for Venezuelans beginning on Aug. 25. In Ipiales, Venezuelan mirgrants who said they had hitchhiked for days were huddled under blankets in tents when a team of Reuters arrived there late on Friday. Exhausted and hungry from their travels, some had scraped a few pesos together to buy food. "I understand why Ecuador's doing this, it's for security, but we have to understand this is a particular phenomenon, given Venezuela isn't issuing IDs to people leaving the country,” Jorge Enrique Quiñónez, deputy representative of UNICEF Ecuador, told Reuters. Over the last two years, especially, many Venezuelans have struggled to obtain passports amid the OPEC nation's political and economic chaos. Waiting in line for her passport to be stamped, 43-year-old Berta Casteñada, a Venezuelan math teacher, said she knew people who had been waiting for the prized documents for years. "It takes forever," she said. Sitting on the floor outside a public toilet with her head in her hands, Adrianil Blanco sobbed. She said she had spent two weeks hitchhiking and walking to reach the Rumichaca crossing. Her tattered canvas shoes were a testament to hardship. Blanco had arrived at the border at 11 p.m., with an hour to spare. She said she had no passport and her national ID card, a piece of laminated paper, was damaged so Ecuadorian border officials would not accept it. "They don't understand what it was like getting here. We got wet, we were sleeping on the streets," she said. Christian Kruger, head of Colombia's migration authority, said on Friday Colombia has been bending the rules on migration issues to give a "helping hand" to Venezuelans. "We're taking about 3,000 people a day. If they start to accumulate we'll see a large population around this area." He did not elaborate, but a buildup of refugees in and around Ipiales now seems unavoidable. This year alone, 423,000 Venezuelans have entered Ecuador through the Rumichaca border. But for Blanco, Malavolta and his fiance, the lack of passports means having to look elsewhere to make a new start.